ibis Styles Krabi Ao Nang is located in the heart of Ao Nang, only a quick walk to the main shops and restaurants and a short shuttle bus ride to the beach. 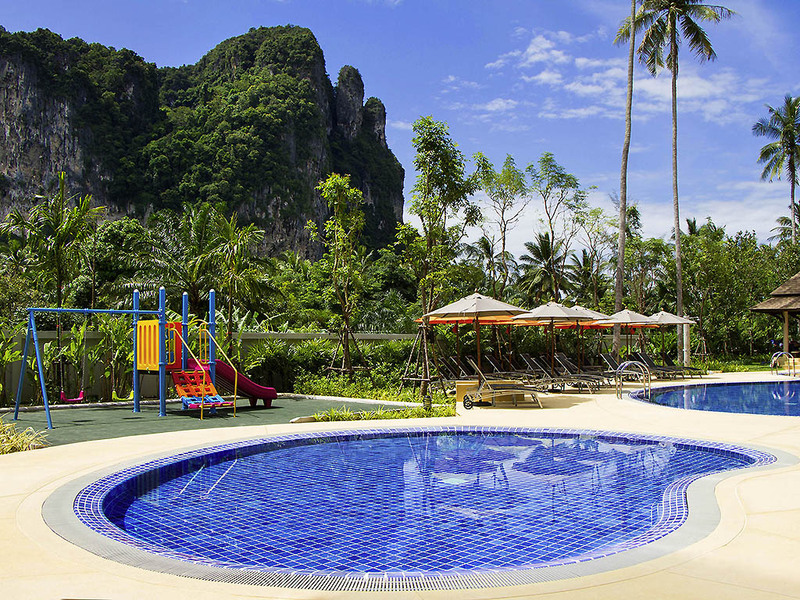 The hotel offers a perfect base to explore the natural beauty of the Krabi province, its beaches, islands and national parks. Railay Bay, Phi Phi, Lanta and the famous James Bond Island just to name a few, are peacefully waiting for you to discover. Book your tours directly from our tour desk located in the lobby for your convenience. Guests are walking distance from the night market and entertainment, and five minutes from the beach and pier by free hotel shuttle, making it easy to explore James Bond island, Phi Phi, Railay, and more. Chill out with friends, or have a casual business meeting at the lobby bar, which has an extensive menu of refreshing drinks complemented by tasty tapas. The Hotel was amazing, great breakfast, especially the Egg Station, great products and very tasty. W had one dinner at the Cliff restaurant and it was super and very tasty. The rooms were perfectly cleaned every day, but above everything i need to underline the great people working in the Hotel...really king, good, always helpful, always smiling and keen to do their guest stay really pleasant. We had a lovely time in a family room with lots of space and a view over the pool. Shuttle into town was good and the staff were very friendly. Staying in Krabi 2 night and Phuket 4 nights. I would recommend IBIS Krabi but will never come to IBIS Phuket Kata. Frequent Business traveller but this was my 1st bad experience in Phuket. Coming back to krabi- Friendly staff, well maintained rooms, close to beach and good Breakfast. Overall we enjoyed our stay. Overall experiences to stay in Ibis was very excellent , staffs was very helpful , breakfast was tasty. I would also recommend even to my other friends and families as well . We had a good time at ibis enjoying the facilities and Amenities given. But the travel Agent was sitting next to ibis reception counter was not helpful and informative . The place is clean and near lot of restaurants. It’s very convenient. I stayed 4 days but the television in the room was not working that make me very moody. Staff were fantastic, hotel was immaculate and such a good location! I stayed here by the booking through the site &quot;Accor staff rate&quot;. The dining room staffs during breakfast, smile, cheery and lovely. Including the kitchen staffs at the buffet line while they re-fill their food. Please, pass my appreciation to them. #Thank you so much. Best regards, Chonticha C.
It was overall good experience. Actually rooms were little small compare to other hotels we visited in Phuket or Bangkok. There were very little free space to put our luggage and then cant move in the room properly. Another issue was Wifi internet. It was disconnecting continuesly and was at bad speed as well. Not good...first night no power and AC...no proper response from hotel team...also room partition wall are not properly sealed or closed between rooms... No lock in the toilet. It was an enjoyable stay for us. The staff were friendly and approachable. The cool drinks and snacks were a bonus. We felt at home. I am really disappointed with experience that me and my family had during stay at your hotel. I would like to bring in your notice that during my stay there was a long power cut from 9 pm till 12 midnight. There is no power back up available in your hotel. The room has no fan , AC was non functional during power cut. When my wife went to mention her complain to the reception one of the manager TALKED SO RUDELY with us that i cannot mention. We (two families) slept on the reception itself. I have photographs of families sleeping at reception. When asked about the name of the manager , reception people refused to give and manager (which i think he was not) went away from hotel and never met us again upon repeated calling as we decided to complain in written against him to the management. This type of behavior is NOT acceptable by me and my family. We felt insulted due to dis-courteous behavior of reception people and manager. Second problem came at breakfast. We have small children who like eat pan cakes in the breakfast. At about 10.15 am we demanded for pan cakes and staff said we are finished with the breakfast now. although there were 15 mins remaining in the breakfast to close. This is really bad that after sleeping on reception , my children didn't have proper breakfast to eat . Also i must add i paid exclusively for breakfast at the reception for which i was denied. Lastly, at the time of checkout , no body assisted us to take luggage at the reception. We called at the reception but we were told that hotel didn't provide this kind of service for guests. I must mention that after paying at the hotel we were not able to get normal services from the hotel. I would like to share same feedback on TRIP ADVISOR ALONG with photographs. also i would not recommend any body to stay in your hotel in future. Nice rooms, massages by pool, free snacks at lobby, nice buffet and warm friendly staff. From the moment we checked in, throughout our stay until the last day, the hospitality was beyond comparison, which provided a feeling of being at home. The facilities and location is really strategic and adequate. Only limitations are the size of the rooms which can be cramped if you have a couple of suitcases (which takes up walking space). Not much of a concern unless you spend a lot of time in the room. Your staff that did my check in, Nina made a fabulous first impression and was extremely accomodative to meet our needs. Thanks, Nina. My first Ibis stay, and with this experience would certainly NOT be my last. Dear Vishva L., We very much appreciate your comments regarding your stay at the ibis Styles Krabi Ao Nang. It is always a pleasure to receive positive feedback. I will share your comments with our team. I am sure that this feedback will serve as an encouragement to all of our staff as we strive to continuously improve the quality of our services. Thank you again for sharing your experience, and we hope your next visit will be as pleasant as the previous one. Sincerely, Uttharathip O-Phang Executive Secretary. Very good hotel, excelent location, rooms very clean and amazing breakfast buffet. Free shuttle to the beach! Massage service, concierge service and everything you will need to relax and have a good time!